Often, when brewing Magic decks, sideboards are an afterthought. Players put together a rough sixty cards for their main deck, and pick out a pile of sideboard cards that are popular in the deck's format. In formats like Modern and Legacy, sideboards are widely populated with specific hate cards to stop problematic archetypes like Affinity, Infect, and Dredge. In formats like Standard, sideboard cards are usually geared towards honing your threats and removal to line up best against your opponent's threats and removal. In Pauper, there is generally a bit of both: hate cards exist for the all-in strategies, but it can be tough to find proper hate cards for decks like Teachings or Mono Black Control. Building a sideboard is a careful balancing act between helping your strategy and hurting your opponent's, so it helps to know the options available to you. Today, I present a compilation of those options: a list of the most popular sideboard cards in Pauper, divided by use, then by color. Some categories do not have options for some colors, while others are packed with choices. I assembled the list from the metagame data on MTGGoldfish.com, based on the most popular sideboard cards for the top twelve archetypes. This is no substitute for browsing Gatherer yourself and finding the options that best fits your specific deck, but these should help sketch out a basic sideboard for you. Now, without further ado: the cards! Graveyard hate refers to cards that specifically target a player's graveyard, usually by exiling it. Pauper has many decks that abuse flashback spells like Mono Black Control, as well as the all-in self-mill decks like Angler Delver. Plus, Eternal Masters just introduced Nimble Mongoose into the format, and turning it back into a 1/1 after a deck has invested into turning on threshold could become very important. 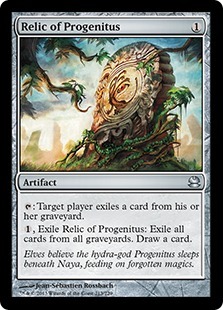 Relic of Progenitus is the go-to piece of graveyard hate in Pauper: it's cheap, offers a small form of graveyard hate that can keep a graveyard under control early, and replaces itself when you cash it in to eliminate the graveyards later, at the cost of a single mana. Being colorless means this card fits in almost every deck, though decks that abuse the graveyard themselves may want to avoid this option. Technically a colorless option, Nihil Spellbomb lets you exile a single graveyard, making it slightly better for any deck that heavily abuses its own graveyard. For most decks, Nihil Spellbomb's lack of board interaction is not worth the trade-off, but Black decks that can pay the requirements to draw a card may find it more useful than Relic. In addition to Nihil Spellbomb, Black has access to Crypt Incursion as a way to not only eliminate any creatures in the opponent's graveyard, but also gains the deck some extra life to survive against aggressive decks. It does nothing against non-creature spells, which is relevant for flashback, retrace, and Mnemonic Wall combos, but the trade-off for the cushion against aggressive decks is often worth it, especially for a deck playing Mystical Teachings. Artifact hate refers to cards that answer problematic artifacts. Many decks in Pauper, like Kuldotha Jeskai, Grixis Metalcraft, and Tron, use artifacts for mana fixing and utility. In addition, Pauper is one of the only eternal formats where the five colored Artifact Lands are legal and are regularly played, and Affinity in particular leans on these lands to accelerate out an unreasonable amount of pressure. There are also occasional Trinket Mage packages that use some utility artifacts, and a few powerful sideboard cards are artifacts. Basically, if your deck is not ready for artifacts, your deck is not ready. Although White has access to many artifact hate cards from Magic's history, the most often played one in Pauper is Kor Sanctifiers. Giving you a 2/3 in addition to destroying an artifact or enchantment is an exceptional rate, especially when most white Pauper decks play Kor Skyfisher to abuse effects like this. Of course, there are fringe options like Dust to Dust or good ol' Disenchant, but the value offered by Kor Sanctifiers makes it the general go-to option. Typically, Blue does not have a lot of ways to interact with artifacts once they hit the battlefield. However, it has an incredibly-efficient counter spell that can hit them on the way in: Annul. For a single Blue mana, this can cut off Prophetic Prism from three-plus-color decks, Myr Enforcer from Affinity, and even Relic of Progenitus if you need to protect your graveyard. It is a bit narrow in its targets, though, so if your deck needs to hit a wider berth of card types, consider Negate or even Counterspell itself if you are heavily blue. If the artifacts manage to hit the battlefield, Blue can also return them to their owner's hand. Echoing Truth can return any nonland permanent to its owner's hand, giving you the opportunity to counter it later. Hoodwink is also available to bounce artifacts, and hits enchantments and lands if there are not as many threatening artifacts. Artifacts are not technically "living" things, so Black often has a hard time dealing with them. The creatures are vulnerable to targeted removal like Doom Blade or Victim of Night, but to hit the noncreature ones, Black has to rely on discard. Duress is the best option available in Pauper to hit problem artifacts early. Outside of that, Black decks look to just out-grind, out-control, or out-play artifact-heavy decks. Where blue and black struggle, red can handle artifacts with its eyes closed. Smelt is the quick-and-efficient option for decks looking to answer pinpoint artifacts as cheaply as possible. Smash to Smithereens is the best choice for aggressive or burn decks that are looking to handle problematic artifacts, while Shattering Pulse is reusable for big-mana decks to destroy artifact strategies. If the deck is also green, Ancient Grudge is a great option that can be reused to answer multiple threats, and is still usable if it gets milled, discarded, or countered. However, if your deck wants to have those "accidental win" moments against decks like Affinity, the best choice is the pricey Gorilla Shaman. For a single colorless mana, you can machine-gun away all of an opponent's artifact lands: it can be a nightmare as a turn-two play against Affinity. Of course, it is a miserable top deck later in the game (good luck handling a Myr Enforcer) but the trade-off is there for it to give you a lot of "surprise" wins. Generally, green's artifact-answers also hit enchantments, which makes them more versatile than, say Red artifact hate, but a tad more expensive. The classic Naturalize is always available, and Nature's Claim is cheap and efficient for any deck that isn't obsessed with bring down life totals quickly. For those that are, Natural State can hit any low-mana artifacts (including the lands). However, one of the best options for creature-heavy decks is Gleeful Sabotage. Basically a two-for-one, this card definitely belongs in any deck looking to answer artifacts while playing creatures. Artifact hate answers artifacts, so it makes sense that Enchantment hate answers enchantments. Modern-day enchantments are less-than intimidating, but Pauper has a few older examples that can be quite threatening. Hexproof is full of power enchantments like Armadillo Cloak and Ancestral Mask that demand fast answers. Other decks use enchantments as removal, such as Journey to Nowhere and Oubliette, and removing those can return lost creatures. Fortunately, Pauper has some powerful pieces of enchantment removal for the colors that can access it. White is the color that is the self-proclaimed best color for answering enchantments. The classic Disenchant lets you answer enchantments and artifacts, while the more efficient Erase handles any enchantment permanently. For players looking to get more than removal out of their sideboard cards, Kor Sanctifiers leaves behind a 2/3 body while destroying an artifact or enchantment. Decks that are also playing Green can make use of Ray of Revelation to handle two enchantments, and it still has a use if you are forced to discard it. Finally, for decks focusing on multi-enchantment strategies like Hexproof, Leave No Trace can handle Ancestral Mask, Utopia Sprawl, and Armadillo Cloak in one shot. Blue typically struggles with resolved enchantments, but it has plenty of options to handle them before they hit the battlefield. Annul is the cheapest answer, and also has applications against artifacts. For more flexibility, Negate hits any noncreature spell, and for heavy-blue decks, Counterspell hits any of them. To undo already-resolved enchantments, Echoing Truth can bounce multiple enchantments, Disperse hits any nonland permanent, and Hoodwink can even hit your opponent's tempo by bouncing lands. Black has no way to deal with resolved enchantments, so it has to rely on discard to answer the problems while they're still in their owner's hand. Duress is a cheap and easy way to take them out, in addition to hitting other noncreature cards and giving you some valuable information about your opponent's hands. Wrench Mind is another good option for heavily-Black decks, as it hits two cards for only two mana. Unfortunately, Red has no good answer to enchantments in this format. Those creatures you lost to Journey to Nowhere are just gone, and you'll have to burn your opponent out quickly so you don't lose to Armadillo Cloak. Or, you know, splash another color. Generally, green's enchantment-answers also hit artifacts, which makes them more versatile, but a tad more expensive. The classic Naturalize is always available, and Nature's Claim is cheap and efficient for any deck that isn't obsessed with bring down life totals quickly. For those that are, Natural State can hit any low-mana enchantments (which are most of the enchantments in Pauper). However, one of the best options for creature-heavy decks is Gleeful Sabotage. Basically a two-for-one, this card definitely belongs in any deck looking to answer enchantments while playing creatures. Lands may not typically seem like problems that need to be answered, but in Pauper, there are a few value lands that must be respected before they take over the game. The Tron lands are perhaps the most notorious example, but Haunted Fengraf can also produce extra value and the Karoo lands represent some powerful mana generation, especially in conjunction with the newly-introduced Peregrine Drake. Fortunately, most of the colors have options for handling these powerful lands. White may have the most notable Land Destruction spells in Magic's history (like Armageddon and Balance), but it lacks good options at common. Focus on winning before the powerful lands are online, answer the threats the lands create, or just rely on a splash color to deal with the problem. Blue may not have ways to directly remove the problematic lands of Pauper, but it has a few ways to neuter them. Sea's Claim is one-mana way to shut off a Tron or Karoo land, but since it still leaves them with a land, it's really card disadvantage that only the most aggressive decks can handle. However, Spreading Seas fulfills the same purpose for an extra mana, while cantripping to make up the lost value. Blue is often better off countering the problems that these lands create, but if they prove to be problematic, at least there are a few answers. The is only one widely-played land destruction spell in Black, but it's a very powerful one. Choking Sands can answer any non-Swamp land, and takes a hit at the opponent's life total. Black also has a Sea's Claim color-shift in Evil Presence and a Spreading Seas variant in Contaminated Ground, but those are less popular and less powerful than the straight up removal options. While Red is the king of answering artifacts, it also does a pretty good job of answering lands. Stone Rain is the classic option for decks that are not heavily Red, while Molten Rain is a better option for heavy-Red decks, as it deals a little damage while destroying the land. However, for hyper-aggressive decks looking to get ahead quickly, Raze lets you trade a land for one of your opponent's land at the cost of a single mana. For decks that need very little mana to run anyway, this can be a very powerful option. Green has few options for destroying lands at common, and only one really sees play: Thermokarst. It requires a heavy Green commitment, but for a deck like Elves or Stompy, it's a perfect fit to slow down mana-hungry decks. Notably, Skred is playable in Pauper, so getting the bonus for destroying a snow land is not impossible. In Magic, sideboard games usually go longer than mainboard games. One of the biggest contributors for that is that after sideboarding, decks can hone their removal spells to answer their opponent's specific threats. Pauper has access to an abundance of cheap and efficient removal, so practically every color has access to various types of removal when building a sideboard. Surprisingly, there are a few colorless cards that function as removal spells in Magic. For example, Serrated Arrows is an old common artifact that shows up in decks like Delver for matchups that require removal spells. In addition, Quicksand is a land and a removal spell that can hit important threats like Kiln Fiend without getting countered by Apostle's Blessing. On top of that, decks that play a lot of creatures and can make a lot of mana (Read: Elves) can use Viridian Longbow to pick off troublesome creatures. Finally, while technically a Red spell, Gut Shot can be cast for life, making it colorless and playable in virtually any deck. Most decks that employ it are looking to stop early aggressive threats: namely, Delver of Secrets. It may be tough for removal spells to compete with Journey to Nowhere, but there are a few options available. Celestial Flare, for example, can be great for dealing with decks that attack with only a single creature, like Delver Fiend or Hexproof. Sunlance can play early-game defense against nonwhite aggressive decks like Goblins and Stompy. Finally, Oblivion Ring can be used as a catch-all for decks that max out on Journey to Nowhere but still need more removal, for either creatures, artifacts, or enchantments. Be warned, though: some decks bring in enchantment removal against decks with Journey to Nowhere, so be careful to not set yourself up to get blown out. While Blue may not be the color of direct removal, there are a few pseudo-removal spells that the color has access to. Specifically, Narcolepsy functions as a two-mana "removal" spell that can keep creatures out of combat, though it does not stop any annoying abilities. Plus, some decks like Stompy and Elves have cards that can easily untap creatures like Quirion Ranger that get around Narcolepsy so be careful about what decks you use it against. 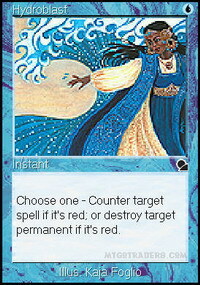 Another more-restrictive removal spell is Hydroblast, the biggest Red hate card in the format. It kills any Red threats, like Kiln Fiend, Nivix Cyclops, Atog, and Avarax, and if there is no annoying threat, it can counter problematic spells like Lightning Bolt, Pyroblast, Temur Battle Rage, and Fling. Basically, if your deck is Blue, there is a chance it should play some number of Hydroblast. Also, Coral Net works well against Green and White threats, though giving your opponent a choice is not always the best plan. Some colors only have a few different removal spells to choose from; Black has tons of different types of removal spells. If the opponent is often low on threats, edicts (cards that make an opponent sacrifice a creature) like Chainer's Edict and Diabolic Edict. If the opponent has small threats that need to be answered early in the game, Dead Weight and Disfigure can handle them. If there are threats that general targeted removal works well against, Doom Blade and Victim of Night hit most threats. If the opponent floods the board with smaller creatures, Nausea and Shrivel can handle them, and if the threats are large and your deck is heavily black, Pestilence and Crypt Rats can sweep away virtually everything. Or, if your deck can make a large amount of mana, Evincar's Justice can sweep away plenty of creatures and whittle away at your opponent's life total. Some permanents can give Black fits, but those permanents definitely aren't creatures. While Black is the best color for answering creatures, Red can hold its own here as well. Red generally plays Lightning Bolt in the main deck, but if you need more removal, Flame Slash is cheap, efficient, and hits most single threats in Pauper. If instant-speed is more of what you are looking for, Lightning Axe answers anything for a price and Carbonize can hit them, kill them, and exile them. Electrostatic Bolt is also an option for decks looking to answer artifact creatures at instant speed. For board wipes, Red has the ubiquitous Electrickery for small creatures, Martyr of Ashes for bigger creatures if your deck is all red, and Krark-Clan Shaman if your deck is full of artifacts. Finally, for those pesky Blue decks and their counterspells, Red has access to Pyroblast, answering every blue threat and stopping every blue answer. Unlike the other colors, Green is more likely to make threats that need to be answered than to answer threats. However, one spell pops up in Stompy lists that fits the bill: Epic Confrontation. The added stat bonus helps Stompy's small creatures answer problematic threats like Kiln Fiend and Nivix Cyclops. Beyond that, Green looks to diversify its own threats rather than deal with its opponent's creatures. Some decks need to focus on improving removal when sideboarding to answer specific threats. Others, however, have the specific threats that need to be answered, and their sideboard plans allow them to hone those threats to dodge the opponent's removal and handily win the day. Each color has a few ways to either change their threats or incorporate protection for them, and it varies from deck to deck which route is better to take. First and foremost, there is the biggest creature to grace the Pauper format: Ulamog's Crusher. Clocking in at eight mana for an 8/8 that must attack each turn, its stats alone are almost enough to make it a threat. However, the big selling point for the Crusher is Annihilator 2, which lets it slowly eat an opponent's permanents as it attacks, in addition to the chump-blocking creatures it absorbs. If you are a big-mana deck looking for extra threats in game 2, or a late-game control deck looking for a threat to close out a game quickly, there are few options better than Ulamog's Crusher. In Pauper, White is not usually the color looking to establish a large threat and win with it; White is more likely to swarm the battlefield with tons of creatures or grind out an advantage with creatures like Kor Skyfisher. For these decks, losing every creature to removal can spell a quick defeat, so one of the best things to do is to add in creatures that can absorb some of that removal. Safehold Elite's Persist ability lets it eat two removal spells, making it advantageous against edicts. To fight board wipes, Lumithread Field offers a cushion that turns off cards like Electrickery and Shrivel. Sometimes, Blue has large threats, but more often Blue is looking to control the game, deny its opponent's board presence, and win with overwhelming card advantage. Sideboarding is no different: one of the most common sideboard cards is also one of the most common main deck cards, Mulldrifter. Blue also has a plethora of counter spells to protect its creatures, like Negate, Dispel, Disrupt, and even the classic Counterspell. For the decks that need to fight removal (like Mono Blue Delver or Delver Fiend), Stormbound Geist can eat through edicts and get it some extra damage while your opponent struggles to find enough removal. Finally, for the control deck looking to grind out a long game, Curse of the Bloody Tome can make that grind a bit shorter. Just don't play it against a graveyard deck. Though Black may be the color with the most removal, it has the hardest time dealing with opposing removal. Duress and other discard spells can snag problematic removal spells, but they can rarely take them all. Instead, Black looks to recur threats that have already been answered to force the opponent to deal with them again. Font of Return is popular in Mono Black Control as it adds some devotion until you need it, and it can buy back a total of three creatures whenever you cash it in. Grim Harvest is another option for recurring threats, and it can potentially be recurred infinitely thanks to Recover. Finally, for decks that cast a lot of spells in one turn, Reaping the Graves can recur a large number of creatures in one shot, and is virtually immune to counterspells. And, of course, if you would rather just add another threat, Gurmag Angler turns your answered creatures into fodder to accelerate it out, thanks to Delve. Once, again, Red is really hung out to dry when it comes to adding or protecting its threats. Mogg War Marshal offers a lot of tokens to grind through some removal, as does Ghirapur Gearcrafter. If the deck can manage a little more mana, Beetleback Chief spreads out three bodies to help defend. Unfortunately, all of these tokens are 1/1s, which mean they will be instantly handled by effects like Electrickery and Shrivel. Red is often better off honing its own removal or leaning on support colors for its sideboard. When it comes to protecting your threats and foiling removal, it can be tough to find a color with more creature-based options than Green has. Brindle Shoat, Safehold Elite, Young Wolf, and Wirewood Herald (in the right deck) all help grind through removal spells, basically requiring two each or one of the precious-few exile effects. Spidersilk Armor also gives decks extra resilience against Pauper's mini-sweepers. If recurring threats is more your style, Pulse of Murasa is great for getting back your best creature and giving you a life buffer to actually cast it. In Pauper, most Aggro decks are tuned to deal twenty-to-twenty-five damage as quickly as they possibly can. Because of that, one of the best defenses against them is to increase your life total, making those explosive one-shot kill turns even harder to come by. Not every color has this option, but those that do can really ruin an Aggro player's day. Surprisingly, there are some colorless options, even if they are less efficient than their colored companions. Sylvok Lifestaff lets a deck with small creatures trade their small bodies for larger threats with a slight life total boost, perfect for aggressive mirrors where the opponent seems slightly faster. For decks that can recur creatures, Bottle Gnomes can both chump block a big attack and be sacrificed for a shot of life gain. Throw in a card like Grim Harvest, and the life gain loop can prove overpowering. When it comes to life gain, the most popular choice for White is Lone Missionary. Four life is more than a counter spell for Lightning Bolt, and a 2/1 body can trade up quite easily, or at least absorb a removal spell. Another way to stop those big kill turns is through damage prevention, and White has a few good tools here, as well. Prismatic Strands is a great option for any creature-heavy White deck, as it gives you two fog effects for a relatively cheap price. The more famous, and arguably more oppressive, option is the Circle of Protection cycle: more specifically, Circle of Protection: Red and Circle of Protection: Green. Stompy, Elves, Burn, Goblins, and Delver Fiend can all be crippled by the right circle, and they should always be considerations for big-mana decks that can at least splash White. The average Black deck may have a hard time finding a viable life gain choice, but heavily-Black decks have a few options. Tendrils of Corruption and Corrupt deal damage based on the number of Swamps you control, and gain you that much life. Another choice, if you manage to answer a large number of your opponent's creatures, Crypt Incursion can quickly shut out an aggressive deck's plans. Red lacks any real life gain or fog effects, and it generally does not need them: Red spends more time dealing the damage than worrying about being dealt damage. However, Red does have a powerful anti-fog spell: Flaring Pain. Instant speed, a low mana cost, and flashback make this the premiere way for Red to break through pesky fog effects, and should be included in any Red deck. White may only have a few commonly-chosen options for life gain and damage prevention, but Green is packed full of them. For decks that can flood the field with creatures, Essence Warden can turn every creature into a life boost while attracting your opponent's removal. For the elf-heavy decks, Wellwisher is almost game over for any aggressive opponents. For decks with somewhat large creatures, Feed the Clan represents a whopping ten-point life swing. For damage prevention, Green has the classic Fog for a cheap shot, Moment's Peace for a two-shot effect, Tangle to stop two full combat steps, and Respite can often blank a second combat step from its life gain. Thanks for reading! Did I miss any important options? Have some super-secret sideboard tech you want to share? Let me know in the comments! If you have any questions or thoughts about anything else, you can always contact me on Twitter (@blackdeckwins) and on Tumblr (also @blackdeckwins), where I write articles about Limited and custom Magic card design. You can also check out all of my previous articles on PureMTGO by following this link. Thanks for this article, it was very helpful. I'm glad that the Pulse of Murasa was mentioned, I like that tech in the right deck.